Over the last few years I’ve been pleased to see the Rampion Wind Farm being built off the coast of Brighton. Sitting on the beach, I find the view pleasant, not intrusive. It is named after the official flower of Sussex (who knew?). The wind farm is extensive – there are 116 turbines rated at 3.45 MW, 140m tall to the blade tip. Once fully up & running, it will generate 1,356 GWh of electricity per year, enough to power 347,000 homes (half the homes in Sussex) and save 600,000 tCO2e. 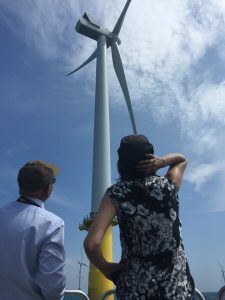 Being an environ mentalist & someone who’s interesting in engineering, I was delighted to join a tour of the wind farm organised by the University of Brighton’s Green Growth Platform. Beforehand, we had a talk from the Project Engineer of Eon, who has overseen the design & construction of the wind farm. This was incredibly interesting, hearing about the challenges of the geology (avoiding the paleochannels, old riverbeds with finer materials which would not have supported the turbines), the need to relocate 12,000 boulders from the construction zone (ranging from a brick size up to 4.5 meters) & also suspected ordinance on the sea bed (1,200 suspected, finding 200 Unexploded Ordinance including 2 World War II bombs). But the treat was to take a boat trip out to the wind farm itself. We had three boats & lucky for me I was on the boat with the Eon engineer, so we continued the conversation. 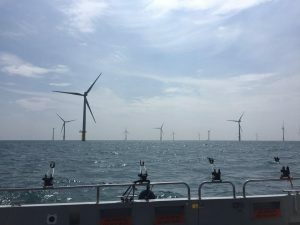 The turbines are around 13 km off the coast of Brighton & it took around 40 minutes to sail out there from Brighton Marina & we had a similar time slowly touring the array itself. Turbines are located 800-900 metres apart, but you’re not allowed to go closer than 50m. The offshore substation was still being commissioned, so a greater exclusion zone surrounded this. It was quiet out there, the main sounds were the waves slapping against the boat plus of course our excited chatting. The media partner for the Green Growth Platform had arranged special permission from Eon to fly a drone – so we got some amazing overhead shots too. To be so close to these majestic turbines was a great experience. Not only to see the structures & understand the positive environmental contributions they make, but also to consider the engineering aspect of the project. There is 144km of cabling within the array, connecting the turbines with the offshore substation (which itself weighs 3000 tonnes) & a further 16km offshore export cables. Each of the monopole foundations weigh up to 800 tonnes & the length of turbine blades is 55m. 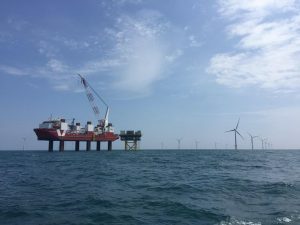 Offshore construction peaked during summer 2017 with 550 people working offshore, around 100 working out of the construction office in Newhaven and a further 150 working on the completion of the cable route and onshore substation. 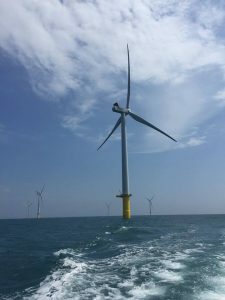 Our tour of the Rampion Wind Farm helped me understand the scale of infrastructure needed to support our energy-intensive lifestyles. I enjoyed the detail of construction & engineering processes, plus of course appreciate the positive environmental impacts arising from renewable energy. OK, it’s not perfect, but I’d so much prefer to have a wind farm built near my home than a nuclear power station. On a lighter note, the white turbines sitting on yellow monopole foundations – they are reminiscent of a seagull! More info about Rampion is here. Liked this post?  Sign up for the Eshcon Newsletter.